Ingrid recently completed this exceptional work entitled, The Traveler. It is quite beautiful and deserves a closer look. The subject is from a 17th Century portrait of a young boy who would later grow up to be king. Innocence pervades this young monarch as he looks to the future. 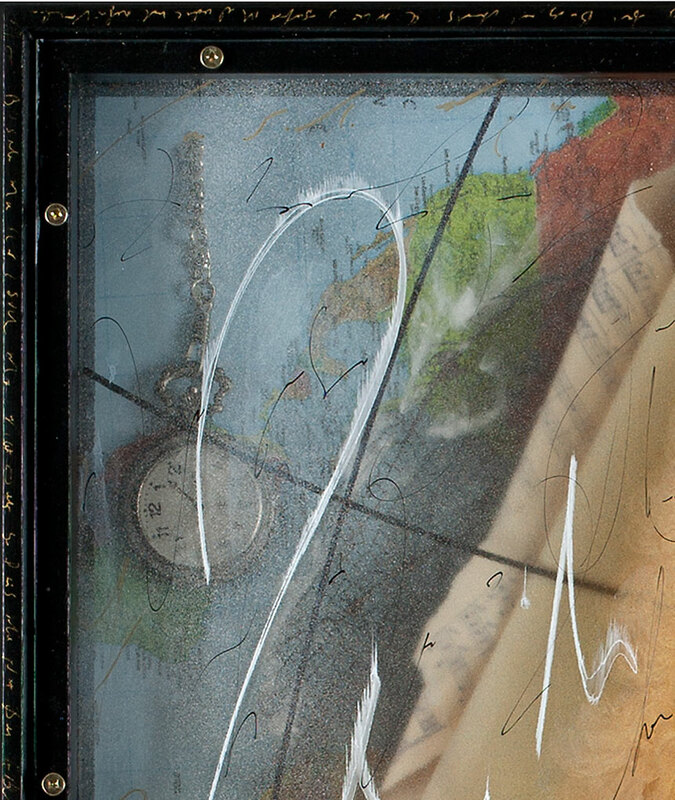 Ingrid wanted to bring him back to our time in her art, so she placed the world within his reach – all the various modes of transportation, maps, a compass and other objects for his journey. Below you can see a detail of the map and compass. These are actual objects in the art and give us a clue as to the actual depth of the piece (almost 4 inches). Photography tends to flatten Ingrid’s work and unless you can see the work in person it is difficult to understand this important aspect of her technique. 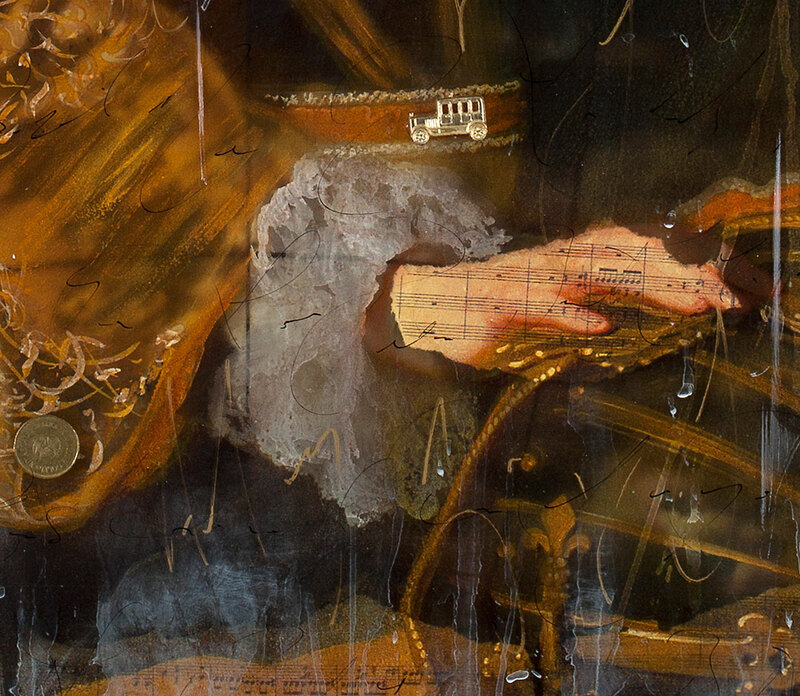 Moving to the bottom of the piece, we see a detail of the prince’s hand laying on his helmet, which gives us a different understanding of “The Traveler.” Perhaps you noticed the toy car on the prince’s his belt. It symbolizes his link to his childhood even as he is busy becoming a king, reaching into his own future. Music penetrates the boy’s hand, one could even say his hand is made of musical notes. As in so many of Ingrid’s works, this signifies the importance of culture and beauty. Next we come to a close up of the prince’s face. We are immediately captivated by his eyes, a young man’s eyes looking out to the voyages ahead, maybe even through time to us. Resting at the outermost layer, they signify a reach beyond his own world. Deeper and below this, we see lines of latitude and longitude, symbols of travel, reminders of those voyages already taken and those to come. Beyond the boy’s face we see layers of music and maps, wisps of clouds, symbolizing life itself, potential, and the unknown. 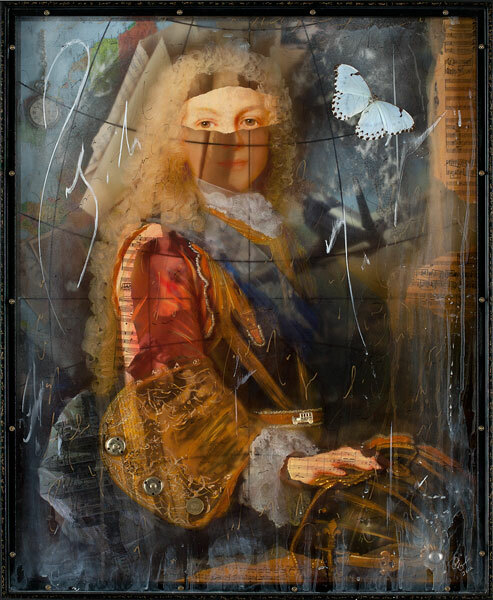 “The Traveler” by Ingrid Dee Magidson, 31 x 25 inches and approximately 4 inches deep. Thank you for taking a closer look. 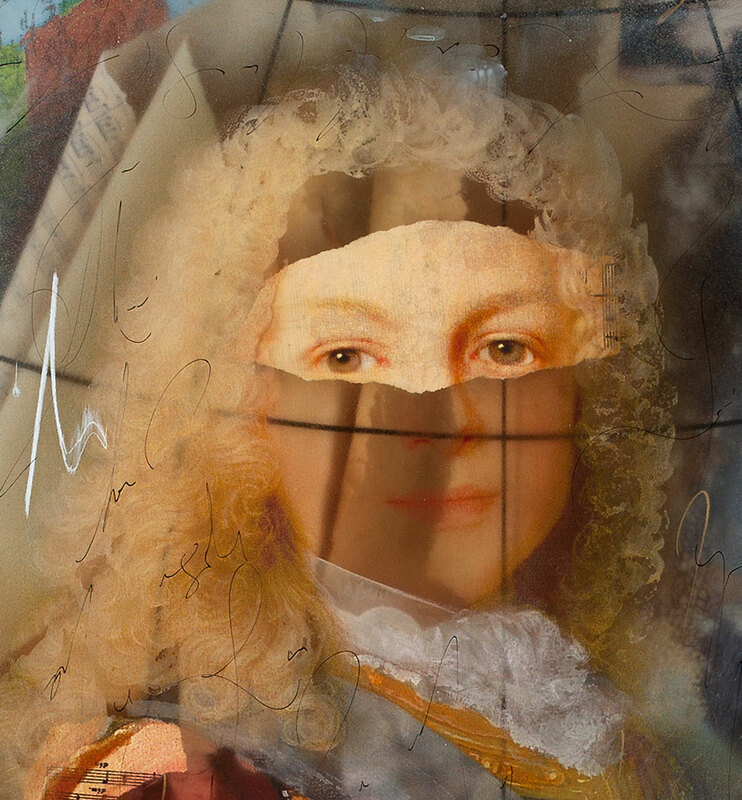 This entry was posted in Ingrid Dee Magidson, Layered Mixed Media, New Work, Uncategorized and tagged 17th Century art, acrylic, Art, contemporary, Ingrid Magidson, King, Prince, Traveler. Bookmark the permalink.